I know I shouldn't do this but here goes again. I'm making plans for a trip lasting about six weeks. 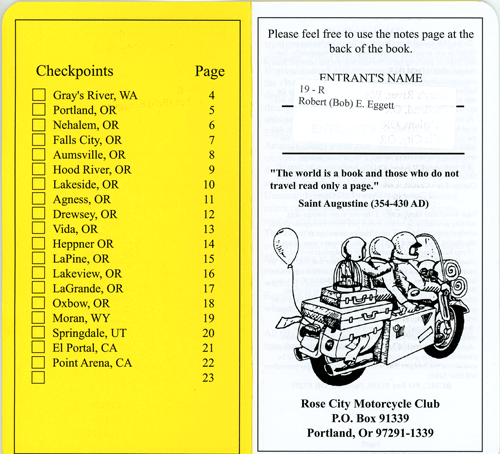 We are again doing the Grand Tour put on by the Rose City Motorcycle Club of Portland, OR. This tour requires that you go to specified checkpoints and get your passbook stamped by local merchant that they have listed in the passbook. This is usually a local cafe or restaurant. Each year there are 19 checkpoints. Fifteen are in, or near, the state of Oregon. The other four are far, far away. This year the extra four are: Point Arena, CA (on the coast north of San Francisco), El Portal, CA (at the entrance to Yosemite NP), Springdale, UT (at the entrance to Zion NP) and Moran, WY (at the entrance to Grand Tetons NP). An entrant has from April 1st to Sept. 30 to complete as many as they can, in any order they wish. At the end of the October there is a dinner at which a drawing is held for prizes. Getting ten checkpoints gets an entrant one ticket in the drawing, 11 = 2, 12 = 3, 13 = 4, 14 = 5, all Oregon checkpoints equals 6 tickets. Then each of the distant checkpoints equals two tickets. The maximum is 14 tickets. We have never gotten them all but are planning on doing so this year. 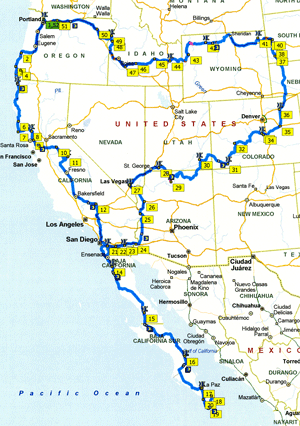 As part of this trip we will be going to some places we have not seen before, Like Cabo San Lucas, BC Sur, Pikes Peak in Colorado and the Black Hills of South Dakota. All told we are planning on going over seven thousand miles in a big loop that gets the four distant checkpoints and some other sights. Another thing we did was to buy a new tent and sleeping bag. The ones from our European trips were worn out!! We had spent over 400 nights in that camping gear and it had been set up and torn down over 350 times. That much usage had brought the price per night down to about one dollar each but put a lot of wear on it. We needed new gear before any more trips were started. We had bought the European set with lightness and compactness as the highest priority because we started the trip without a trailer. Everything was packed onto the bike. Now at home where we have constant access to our trailer and can consider more space and comfort. So we bought a six person tent with garage. My philosophy on tents is that they will actually only hold half, or less, of their rated capacity. Yes, you may actually be able to crowd that many sleeping bags onto the floor, but lets talk reality. Everybody has gear, clothes, toiletries, etc. that must also come into the tent. Room is needed for them too. So we bought a REI Hobitat 6 tent and its detachable garage. No the bike does NOT fit into the garage, but it makes a great place to sit out of the rain or sun without going into the tent.